The 5% Formula is a two part mechanism combining absolute cuts followed by a threshold rule. Combined, they are designed to achieve major, year-on-year cuts to global military spending over 10 years and beyond. It is a long-term, sustainable campaign, with a top-line demand that works for civil society groups in every country where there is a perceived value in challenging policies concerning military spending. 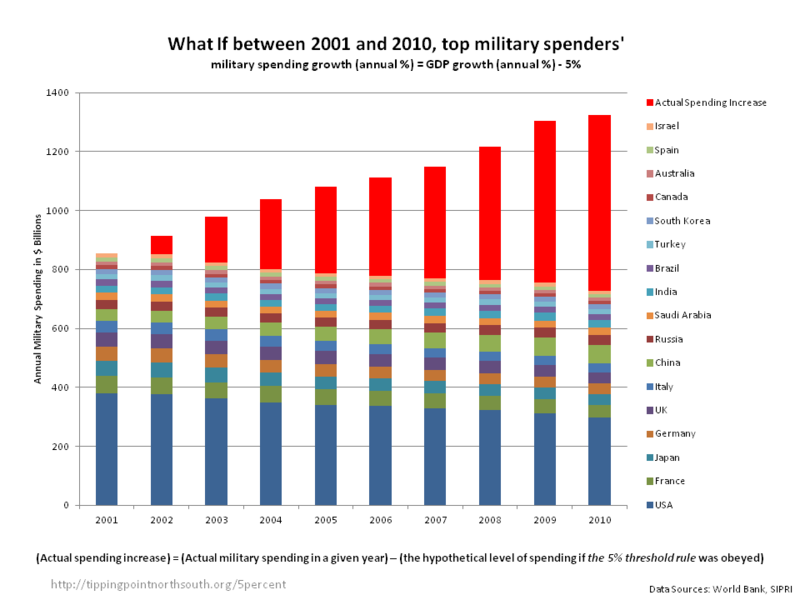 It would see annual global military spending cut by 40% after the first decade, back to mid 1990s spending levels ie $1 trillion dollars, the lowest in recent history (and even then, ‘low’ is not low enough for many peace campaigners – indeed far from it). This would deliver an estimated $700 billion to be redirected to core urgent human and environmental needs. After the first 10 years, we call upon all nations to adopt the 5% threshold rule to sustainably restrain the global military spending – no country allows any increase in military spending to outstrip economic growth. The 5% Formula would therefore drastically cut annual military spending to $1 trillion dollars in a short but practical period of time and then maintain an effective check on military spending in perpetuity by considerably lagging its annual change behind economic growth. The 5% threshold rule in practise means that no country allows any increase in military spending to outstrip economic growth. Most economies grow less than 3% annually; this effectively translates as 2% annual reduction to their military spending. These savings are then divided equally to fund both domestic and international needs. The world military expenditure will gradually decrease, until an equilibrium is reached that emphasises economic/social rather than military advancement. The 5% Formula would therefore drastically cut annual global military spending to $1 trillion dollars in a short but practical period of time and then maintain an effective check on military spending in perpetuity by considerably lagging its annual change behind economic growth. $700 billion in first 10 years: how could it be used? Read the executive summary, the full report, or the presentation slides.